Memories: That Mad Max Great Showdown — Scott C.
Boy, did I love Mad Max: Fury Road. I can’t handle how much I love that film. It was beautiful and so fun to watch. George Miller is just the best. I decided I would paint a showdown from the film. There are a lot of people in this showdown because I really just wanted to paint everyone! I was so jealous of the character and hot rod designs. I wish i came up with that stuff. The Mad Max world is a pretty unique world. So I painted it. Would you like to walk down memory lane with me as i painted it? 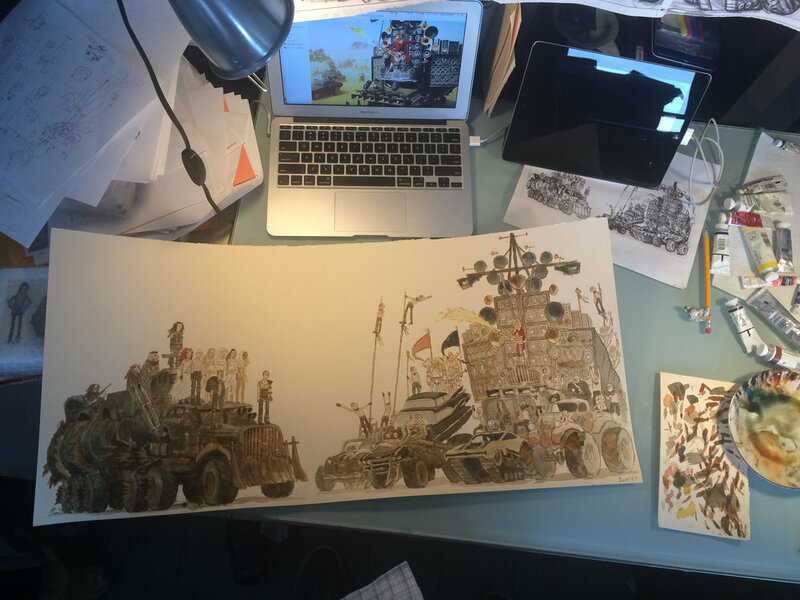 It was not as much work as actually making the film Fury Road, but it was an ok amount of work. I scanned all these little sketches into the computer, cut them up and moved them around in photoshop to make a sweet little composition. Most everyone just stood there looking pleased, but the War Boys had to be having a real good time. SO i made them having just a blast all over the place. They looked like they really enjoyed being War Boys in the movie didn’t they? I printed the drawing out in pieces and taped them together, so I could trace the drawing onto watercolor paper. I started laying in all the big washes of colors first, just so i could feel like i accomplished something early on. I also painted all the skin first for some reason. I am not sure why i do that. A superstitious maneuver i suppose. Here is my little cat’s tongue brush as I painted the wheel there on the Gigahorse. Everything is pretty light here as i started out. Here’s the War Rig. See all the skin painted in? why do i do that first? i do not know. Look how sloppy i painted those wheels. Geez. Everything is pretty sloppy at first. That’s ok, i can tighten it up later. But Mad Max vehicles should be all janky anyway, right? Oh, Geez. Here i am starting on the Doof Wagon. At this point, i was sort of dreading the speakers. I was not looking forward to painting all those speakers. But i sure loved that Doof Wagon. And i was really looking forward to painting the red pajamas on the guitar player dude. The speakers. Here they go. Janky circles all over the place. Alright. All the basic color washes are laid in very lightly. I can step back and check it out happily. Now i can start my favorite part – the linework. Also using the cat’s tongue brush and watercolors. I only use two brushes really. The cat’s tongue and the flat brush. The one stressful part of the linework stage is the likeness on the faces. I am always a little stressed that they will work. Sometimes the drawings look pretty awesome and i screw them up at this stage. Other times, it works the opposite way. And still other times, they just work ok.
Little War Boy is checking out the speakers. The Speakers look a bit better now. I liked painting these pole lines for some reason. Long relaxing janky lines. All the lines are in. Now i go back and punch up the values. Make everything contrast nicely. Oh, the War Rig is looking better i think. Getting some of those darks in there. Carving out those skulls and the grating – super satisfying. Red pajamas on the guitar player! Aw, so nice. I know some of you are bummed that i flipped the guitar player. He doesn’t play left handed like i portray him. I just flipped him and forgot about it. My mistake. Please forgive me everyone. Especially you guitar players. I know how you feel. Ah, yes - everything is getting darker. I am starting to dig it. I am finally digging the speakers here. They look nice when you can get those darks in there to pop them out. Everything needed to be darkened at this point. Even the linework. I usually just darken the outlines and leave the inner lines lighter. It holds the drawing together better. I’m getting really into this Doof Wagon here. I can finally figure out what certain parts look like. Like this arm here that raises the scoop plow on the front of the War Rig. These are things i wouldn’t have ever noticed had i not painted these things! i like to discover those little things in the designs. Treads are looking nice and dirty. Ah, the gang is looking happy! But these guys are just so excited to be there. At this point, i signed my name in the corner there. It is my little reward. And there it is all done! Thank you for walking down memory lane with me, you guys. I hope you enjoyed these memories. See you soon!